It's a new year, and with it, comes a #SongAssociation that'll have you in your feelings all 2019. In our latest chanteuse-countdown-against-the-clock, we called on platinum-selling, R&B favorite, Ella Mai. Watch as she goes deep with Adele, does a little algebra with Beyoncé, and trips over her own tunes for a chance to claim the Song Association title from H.E.R. Ella Mai's self-titled debut album is available now, and catch her on tour: https://ellamai.com/pages/tour. 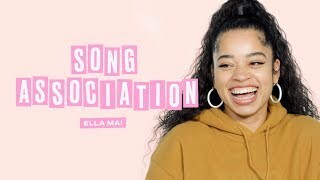 The song of Ella Mai Sings Nicki Minaj, Adele, and Beyonce in a Game of Song Association | ELLE is just for review only. If you really love this song"Ella Mai Sings Nicki Minaj, Adele, and Beyonce in a Game of Song Association | ELLE", please buy the original song to support author or singer of this song.